Don’t see what you’re looking for? Post a photo on our questions page and we’ll get back to you with an ID. Related to spinach (in the goosefoot family), lambs quarters is an edible weed very common in Colorado. It will usually pop up in the very early spring and many gardeners harvest and eat their lambs quarters like spinach (great sautéed or in salads)! If you don’t pull it out early, lambs quarters can grow tall enough to take over parts of your garden, shading out your veggies. So even if you harvest and eat your lambs quarters, pull out the whole plant once you’re done harvesting so it does not take over your garden! Best managed by hand weeding or hoeing. Make sure to pull it out before it gets too big or its strong roots will pull out other plants along with it. The dreaded bindweed! This is a very common, vining weed that has small white, morning glory flowers. It can be difficult to kill because it spreads by both seed and root. If you pull out bindweed and leave a small piece of root in the ground, that root will re-sprout to grow a new plant. However, the best way to get rid of bindweed is indeed to just keep pulling it up! Think of it as a “war of attrition” – starving the bindweed of energy over time. 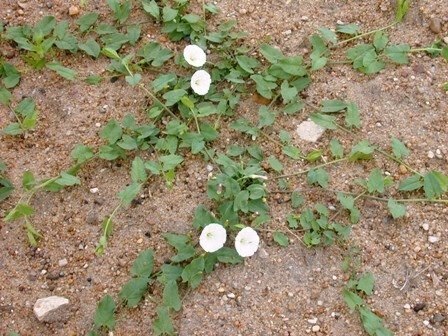 Pull bindweed whenever you see it in your garden and you should be able to eradicate most of it over time. If you have a particularly bad bindweed problem, you can also consider landscape fabric below and/or around your bed to limit its growth. Bindweed is technically edible (but not very enjoyable). Another edible weed, purslane is actually higher in omega-3 fatty acids than any other known leafy plant. It is a succulent plant with a lemony flavor. Many people love purslane from the garden, in salads or very lightly cooked. That said, don’t let your purslane grow long enough to go to seed (unless you want a garden FULL of purslane). One purslane plant can produce over 200,000 seeds! And those seeds can continue to germinate for years into the future. 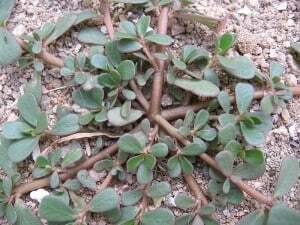 Purslane grows prostrate on the ground from one main taproot and is best managed by hand weeding. 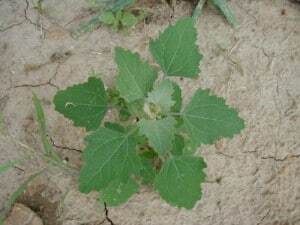 A member of the buckwheat family, curly dock is a very common weed in Colorado and is also edible, although less commonly harvested for food. Dock has broad leaves, a bushy habit, and can get very tall if left to grow. With a deep and strong taproot, it can be hard to get the entire plant out by hand weeding and will regrow from roots left in the ground. The best way to kill dock is to use a shovel to dig up the entire plant (with as much of the taproot as possible). However, if pulling out dock risks ripping out your veggies along with the dock, its best to continue to cut the dock back below the soil surface throughout the season to stay on top of it. At the end of the season, dig the dock when the garden is empty. 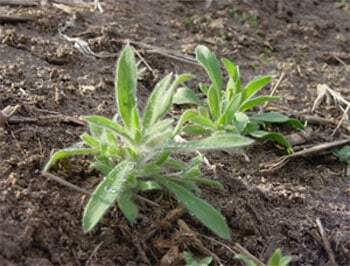 Kochia is a member of the goosefoot family (along with lambs quarters, spinach, beets, and chard). Non-native to the U.S., kochia is now found in all western states, except Alaska. 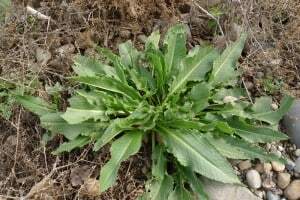 It has grey-green leaves and can grow to be 5’ or taller if not controlled. When small, kochia can often have a slight purple color on the underside of its leaves. Luckily, kochia has a shallow taproot and is very easily pulled if you catch it early. Once you get to know what young kochia looks like, it is unmistakable and so you can watch for it during early germination in your raised bed. Many different varieties of thistle grow in CO, but the one we find frequently in UFCO raised beds is the Canada thistle. Also known as “Creeping thistle”, it can generate growth from vegetative buds on its root system and so it spreads easily and quickly. 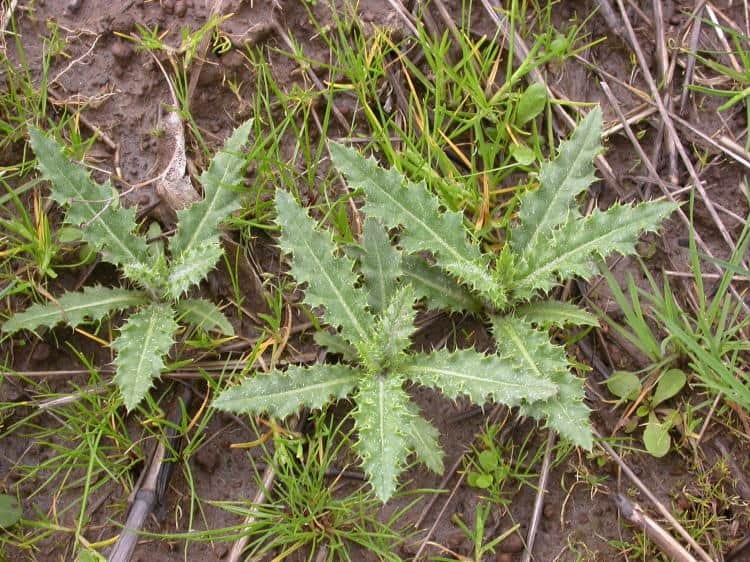 Wear gloves to pull Canada thistle, because its leaves are covered with spines! 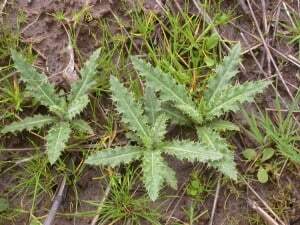 The best way to rid your garden of Canada thistle (or other thistle varieties) is to aggressively pull or dig out thistle when you see it, being sure to get as much of the root as possible. You’ll quickly notice that Canada thistle roots can often spread horizontally across an entire bed from just one or two plants, so you may have to wait to pull all the roots in the off season when you won’t disturb your veggies. Most of you likely already know what dandelion looks like! There are many different varieties of dandelion and they are all edible, from flower to leaves to roots. Most commonly, people eat their bitter leaves in fresh salads or juices. Dandelion is a perennial plant of the Aster family. It has broad green leaves, a low growth habit, and yellow flowers that form fluffy seed heads that travel by wind when released. 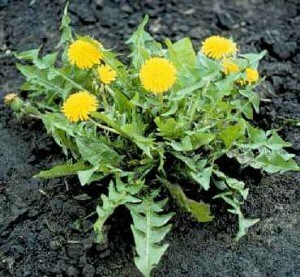 Like dock, dandelion has deep tap roots and thus, can be difficult to get rid of in your garden. If you leave any of the root in the ground, dandelion can re-grow. Dandelion is best pulled out by using a trowel or small shovel to dig as much of the root out as possible. And if you still can’t figure out what you’re seeing in your garden…. Post a photo of it on our Question & Answers page and we’ll ID it for you! Wow, this was super helpful. I didn’t know purslane was edible! What a great resource for gardners. Thank you. Turning soil has this as a method to get a head start. 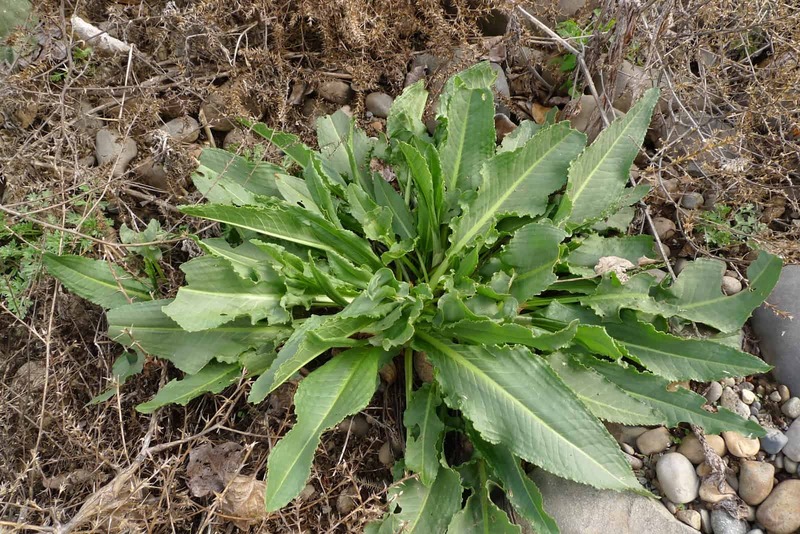 It’s helpful to have loose garden soil, when these 7 weeds show up. Yeah, these are very common plants along the Front Range, especially on vacant lots near your garden. In addition, I see mallow alot, and cheatgrass quite often.